On Saturday, October 23, residents and volunteers gathered at the Rondo Victoria Peace Garden, located at Concordia Avenue and Victoria Street, to celebrate the hard work they did this summer on the new community garden. There were pumpkins to be carved, cider to be sipped, and plans to be discussed on this quiet fall day. In June, the garden first opened with a peace pole dedication as the kick-off to Aurora/St. Anthony NDC’s Summer of Peace celebrations. On Saturday, the garden was put to bed as folks cleaned, raked and prepared for the future. 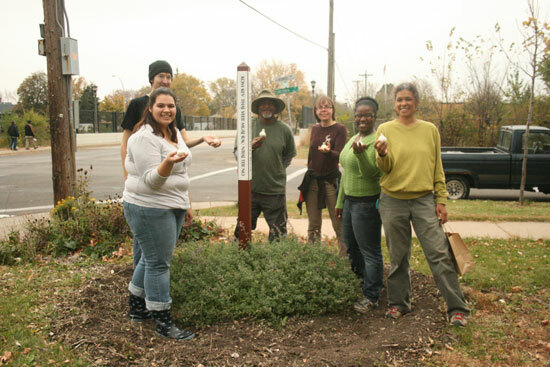 This ending also was a beginning as the group planted garlic sent to St. Paul from AfroEco — a group out of Detroit, Mich., focusing on urban community gardens. The bulbs that had traveled all the way from the Motor City were aptly named Motown Garlic. Future conceptual plans were also shared for the garden, with landscape design ideas including mixed planting beds, apple, cherry and plum trees, plus a sitting area with benches. With the burst in popularity of community gardens — a wonderful way to bring residents together — the Rondo Victoria Peace Garden is a very welcome addition to the neighborhood. It will be very exciting to see what the future holds.